You stalked her product page day in and day out. You waited 2 months to hear more details about this girl. 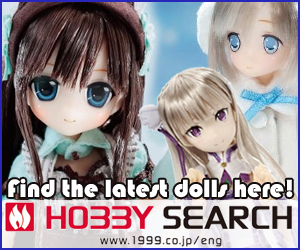 I'm happy to announce that the doll you've been craving for can finally join your dolly family! 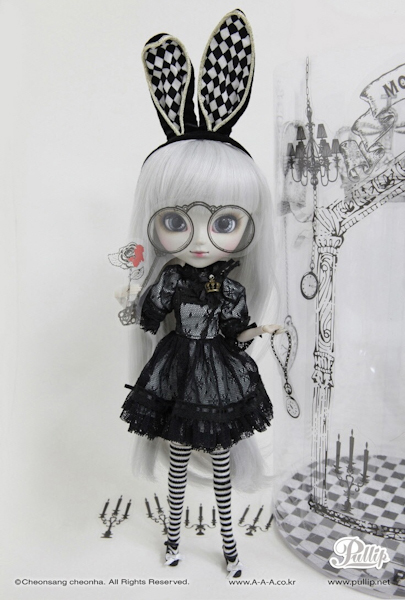 Travel down the rabbit hole with Limited Edition (LE) Pullip Monochrome Alice in January 2018. 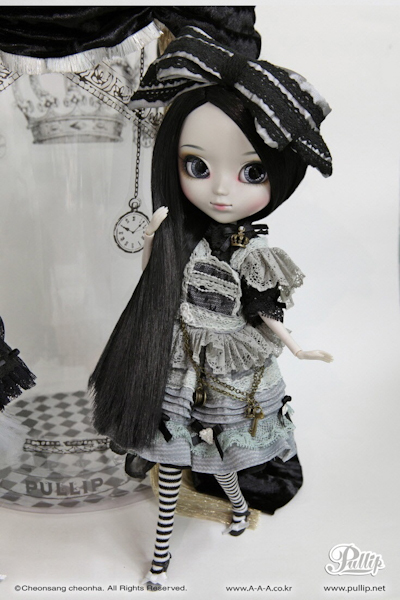 LE Pullip Monochrome Alice is the 2nd Ars Gratia Artis (AGA) LE doll. 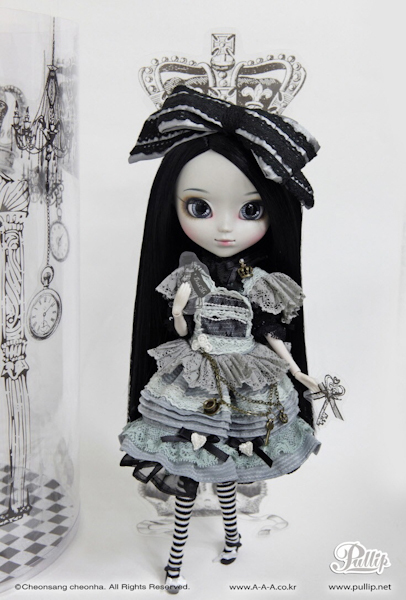 Like the previous AGA LE Pullip Veritas, Monochrome Alice is extremely rare and is limited to only 50 pieces. 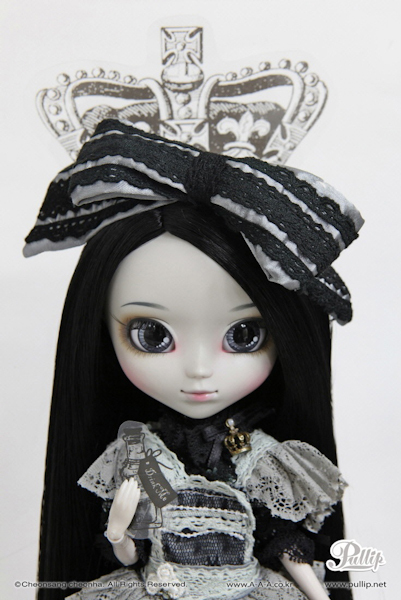 Monochrome Alice is priced at $450 making her one of the most expensive official Pullips to be released. At 1st glance that price seems ridiculously high and I can relate to fans who are unhappy with the direction AGA is taking by releasing a super expensive doll. 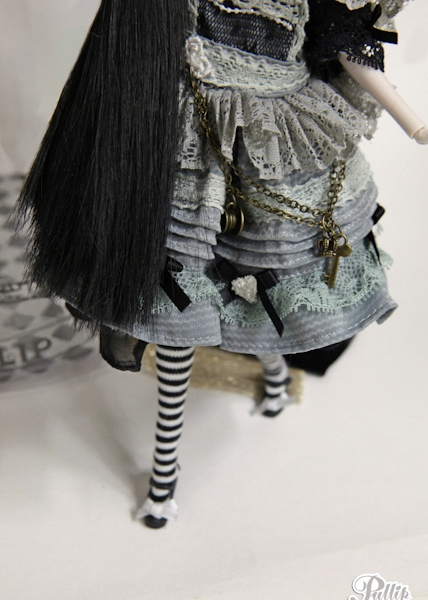 However, when I change my perspective on LE Monochrome Alice, it makes it a little easier to grasp her price tag. She's an ultra RARE doll and having that extraordinary feeling of being 1 out of 50 fans to own her is priceless. Price is in the eye of the beholder. Pullips are now reaching the $200 price range. So, instead of buying 2 or 3 Pullips at $200 a piece like Pullip Utena Tenjo & Pullip Anthy Himemiya & Pullip Cinnamoroll ★ Pullip 15th Anniversary ver. That money could be applied to LE Monochrome Alice, resulting in that special feeling of being 1 out of 50 collectors vs. 1 out of 1000's. 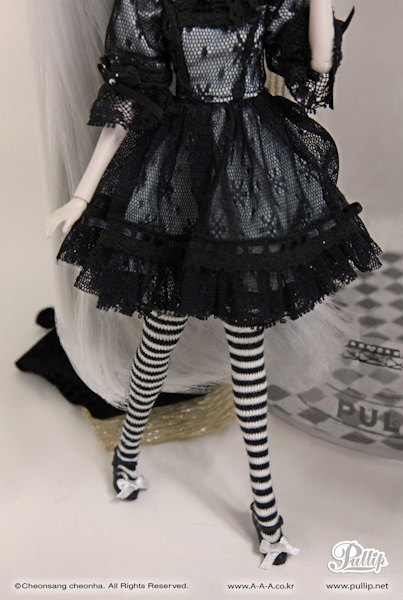 What sets LE Monochrome Alice apart from LE Pullip Veritas is that you she will come with an additional wig allowing you the ability to dramatically change her appearance! Mix up her look by replacing her long and flowing jet black hair with a silver and mysterious wig! One concern I have with the additional wig is how functional it will be. I assume the black wig is attached to her head with glue? If this is the case, it seems odd to rip off a $450 doll's original wig. I'm hopeful that AGA thought about the customers and made removing and swapping the wig user friendly. 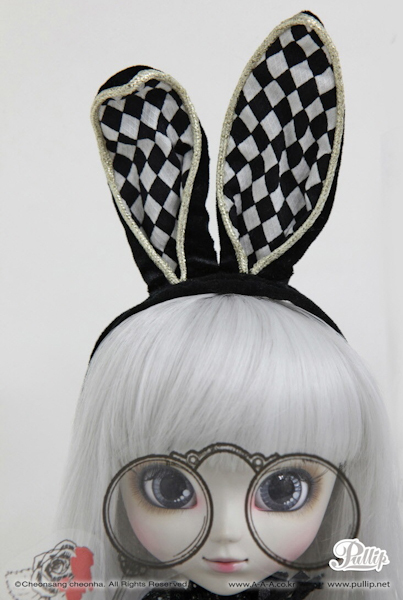 Collectors will also receive a bunny headband accessory, a number of tattoo stickers, and a black curtain. 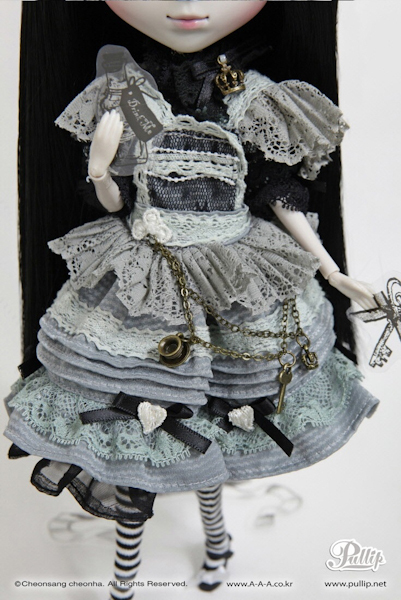 I very much like the concept of offering collectors a highly exclusive Pullip. I wish AGA would use this opportunity of the Limited Edition line to take bolder design risks and stop playing the safe game of presenting fans with recolored dolls. 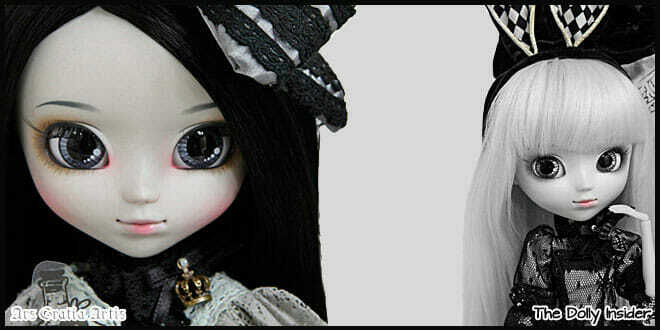 AGA, bring on the never before seen jaw dropping Pullip dolls! There is so much inspiration out there, just go and grab it! I'm curious if we can expect to see another doll released from this line, Who will be next . . . ? 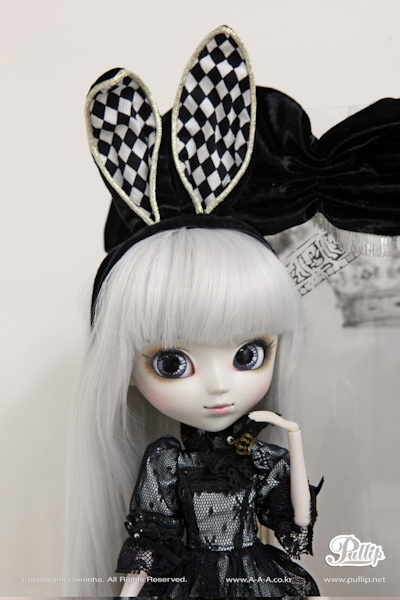 Will you be among the exclusive few to own this elite Pullip? If so, did you pre-order her without a second thought, or did it take some convincing? Do you love her but sadly have to view her from afar? Did AGA's $450 doll send you in an outrage? Okay, so I definitely liked the Alice LE doll at first glance of proto type image and sure the price is higher than most releases, but after viewing so many cute pictures of the doll online, seeing a few owner videos and even pix, and learning recently that a few dolls are left for sale, I took a look at my budget and went for the purchase yesterday. I’m a fan of the skin tone, eye color, soft blush and lip make up and dark hair color combination. If I didn’t buy the doll, i probably would have spent similar amount getting a custom to look like it. Looks so goth and still really cute! I might just use the tattoos too haha! 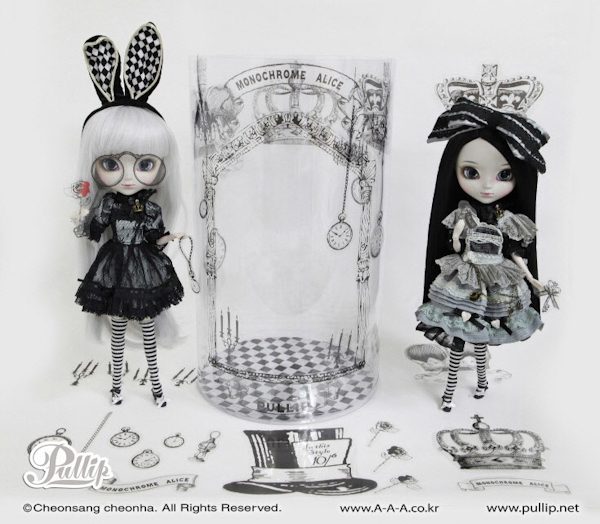 Congratulations for being 1 of 50 worldwide to welcome the Limited Edition Pullip Monochrome Alice home! 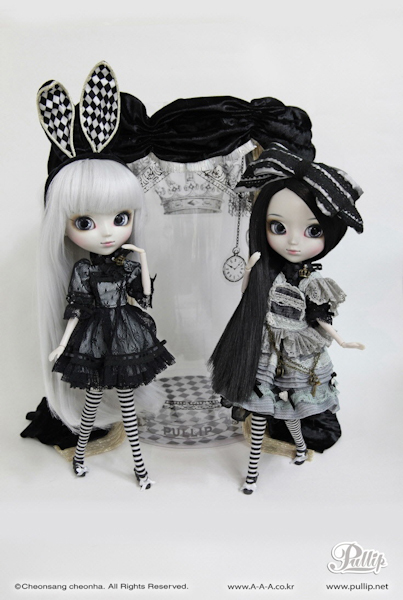 Thank you for taking the time share your opinions on LE Pullip Monochrome Alice! Yes it’s so expensive here it’s moms of 25% of her price and then some extra fees. You could buy a brand new Pullip doll for that price. I’m so sorry to hear that it would cost you even more money to bring Monochrome Alice home. Don’t give up hope on bringing her home a or any grail doll for that matter. After sitting on it for weeks I just pre-ordered her. I got her for two reasons: 1)the black haired version reminds me of American McGee’s Alice which is my favorite interpretation of Alice in Wonderland and 2) I suddenly got a bunch of money for my birthday during Christmas which was a surprise (considering my birthday is in October) and this allowed me to afford her. The price doesn’t bother me because we are getting extra stuff to go with the doll. Although I confess I’ll probably not touch the tattoo stickers since those aren’t really my thing. I’m thinking of getting an MIO kit and making a custom Monochrome White Rabbit with the silver wig/bunny ears. I like the idea of the stage is also cool. I was mostly bothered by the lack of info for this release. I feel like they made this release way more confusing then it needed to be and that was a turn off for me. Only reason I ended up buying is because I knew I would be very sad not to have this Alice as she’s basically my perfect Alice. We are soooo happy for you. The story of how Monochrome Alice became yours is a special one too. Receiving b-day money 2 months after your birthday, it’s like the dolly stars where aligned. I like your idea of making custom Monochrome White Rabbit to go along with Monochrome Alice, sounds like it will be fun. Thanks so much for letting us enjoy in your excitement! We hope you fall even more in love with her when she’s in your collection. Do come back and spoil us with pictures of Monochrome Alice. I am gonna have to pass on this doll. I think the price tag is insane. 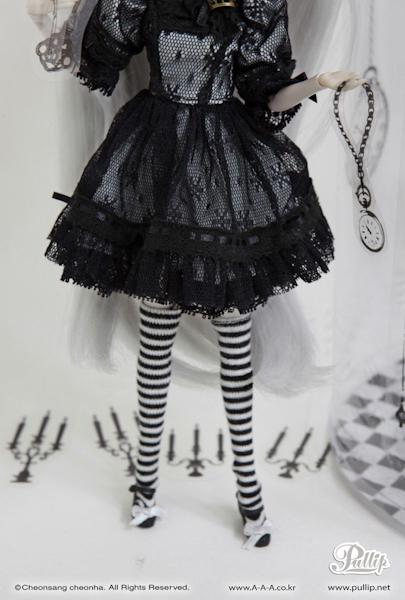 I admit that the idea of having a Limited Edition doll with only 5 in the doll is appealing but for me to spend that kind of money the doll would have to be superb quality and not look as pale as death..
Am I the only one who thinks she is too pale? I mean IF I had to spend that amount of money I would have to have been irrevocably in love with a doll.. There should be no maybes or I would rather it looked so and so..
At that price, you do have to love everything about her. I’m excited to see owner pics maybe she won’t look as pale. I think the price is crazy. If they want to charge that much they need to make better quality clothes and wigs. I’ve had multiple dolls ($200 range) that had wig cuts or hair glued on wrong out of the box. 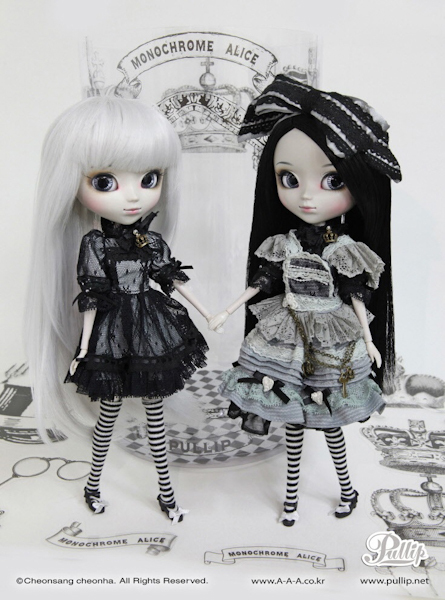 I agree if the quality of LE Pullip Monochrome Alice is the same as any standard Pullips, then that would be a awful for fans who dropped down money for her . I’m hoping since this is an AGA exclusive doll that hopefully they’ll have better quality control with this release. I’m keeping my eyes open for owner pics to find out. I’m joking but no I can’t find any interest in this new version. 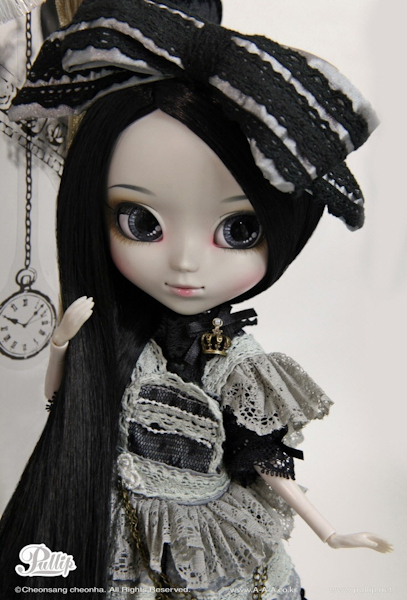 I prefer spending my money in 2 or 3 new pullip models! Or in BJDs! 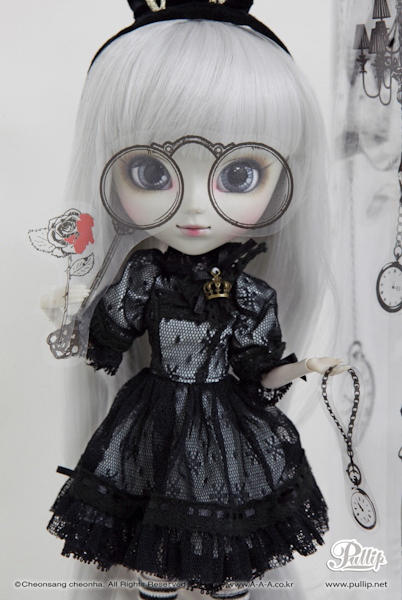 Aside that I saw that Groove have made an article for AGA new LE pullip on their blog. Does that mean that their relationship are better now? Yeah, it’s still a mysterious why AGA is offering their Limited Edition dolls at a higher price. It would be nice if they gave fans a story behind this line, that way more fans can understand what makes these dolls different from regular released Pullips and also why they are priced higher. 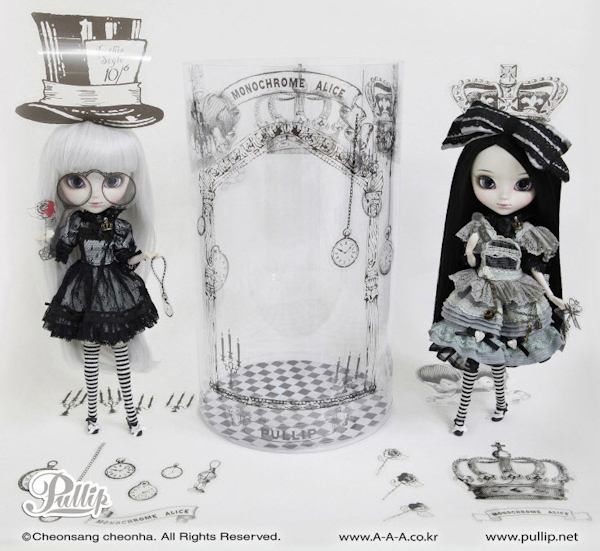 It was nice to see that Groove Inc announced the Limited Edition Pullip Monochrome Alice. I’m curious to know if anyone pre-ordered her and if so I can’t wait to see photos.